What is the best kind of content for a website? Content marketing is not easy. At first, it seems as though all you have to do is prepare some material and publish it online. However, with the growing variety of types of content there is now another decision to make – what kind of content? You could have text, or video, or even audio. But what about infographics? What about data? Even thinking about content in these broad categories is not enough. After all, you can have interviews – in text, in video, in audio, or the basis of an infographic. That’s before you consider lists or slides or interactive elements or webinars. If you can’t think of more than a dozen types of content, you are not thinking hard enough. Zazzle Media, for instance, has produced a list of 101 types of content. Research shows that people love to read. Even though billions of hours of video is available online, reading is still a favourite activity online. Focus on writing and you will get noticed on the web. However, people expect quality writing and they prefer relatively long articles, rather than short, snappy pieces. So, unless you have something good to say, that takes more than 100 words, and which is going to be well-written, then text is not really for you. Text is the most important kind of content online – but it has to be good, especially as there is so much competition. The reason video is so popular online is because human beings are primed to spot movement. It goes back to our days as hunter-gatherers; in order to get food we had to be fine-tuned to detect the slightest movement in animals that were potential food. Our eyes and our brain work together to spot the tiniest movements. Indeed, we often do not notice static things around us. You can see this for yourself when your vision is suddenly interrupted by a fly in the room, or by a curtain blowing in the breeze of an open window. You were not aware of either of those things until they moved. Then you spot them in a microsecond. Because our brains are so attuned to moving things, we love video. So, if you cannot produce text – then start recording videos or make animations. As “The Psychology of Moving Pictures” explains, video is no longer optional. 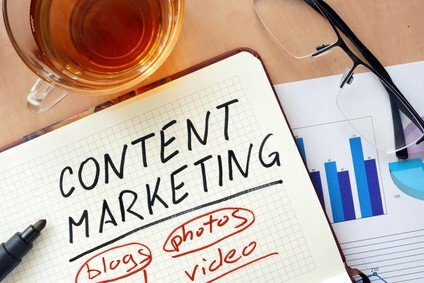 Rather like text, it is a “must have” of content marketing these days. The fact that our eyes and brains have become so good at spotting movement also means that our visual sense is highly powerful. Indeed, we can often understand something when we see it visually, although we could not understand it when we read an article about the same topic. That means your website or blog visitors will be attracted to “infographics”, whereby complex ideas can be explained in a few images. Infographics are one of the fastest growing kinds of content, and as explained in “3 Psychological Reasons Your Website Needs Infographics” they are highly engaging kinds of content. Text, images and movement are the basis of the best kinds of content that truly engage people. Various studies have been completed to discover what specific type of content gets the most engagement, but there is no consistency between such research. Some show that videos get the most attention, others show that “how to” articles are the best. Ultimately, you should not really worry about those fine details. What’s important is that the kind of content you produce has a good degree of psychological engagement and that it is good, really good. Concentrate on quality text, videos and images, and the engagement will follow.